2019 Dixie Chopper 3672BR Classic 36 hp 72 in. The Classic is the ultimate mowing machine with the perfect combination of commercial quality with industrial features. POWER AND MORE POWER: Choose from a Kawasaki® FX or Kohler® EFI engine up to 35 horsepower, or a 36 horsepower Vanguard® engine to power through the tough jobs with ease. LIFETIME WARRANTY FRAME: The strongest frame in the industry with a 1"x 2" 7 gauge steel construction guaranteed not to break. OVER-SIZED HYDRAULICS: Reduces the system pressure within the components to extend drivetrain life expectancy. COMPLETE DISCHARGE CONTROL: An operator-controlled discharge chute allows you to switch from normal discharge to blocking the chute on the fly. 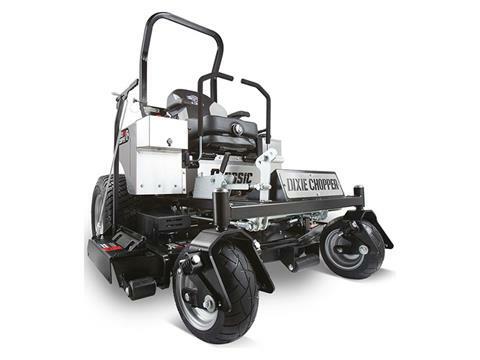 TRIED AND TRUE DECKS: Offered in three deck widths (50", 60", and 72") the Elite X Deck has been the staple piece to Dixie Chopper's reputation of cleanly cutting all types of grass. DECK LIFT SYSTEM: Offers ease of servicing and better ergonomics for operator convenience. 3672BR Classic 36 hp 72 in. Rollbar down - 83 in. Rollbar up - 78 in. 3 - 24 x 2.5 in.